I have a 100 lb 8 month old pure bred Akita who rarely barks (mainly on command), and tonight he was in his pen going nuts barking doing "circles" and marking his territory like crazy. We live on 25 acres of farm land, and upon further investigation I heard the Coyotes who are usually chattering in the far distance, chattering in the darkness of my back yard. Luckily I came out because of his barking and brought him inside, even though he's a monster of a dog he's never shown a sign of aggression I'm not sure he could have defended himself. They must be out in full force as we also saw one walking on the eastbound ditch of the 401 at hwy 25 about 4:00 pm today. 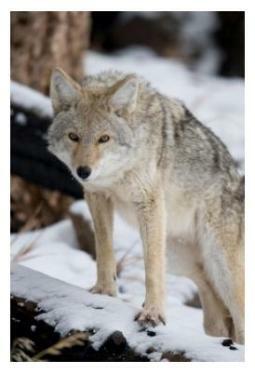 Thanks for letting us know about the Coyotes in your area - it was a good move to bring your dog inside! I hope you don't mind, I added a picture!